When I was (insert impressionable age here), my Ouma had charge of me for a weekend. We'd done Stan's Skateland (if this entry had a soundtrack, it would be Def Leppard's "Rock of Ages") and the monkey swing, I'd spent hours dangling toes off of the dock, gazing into my minnow trap. She must have been up to her eyeballs with me. So she drove me to a dark and dusty farmhouse next to the Blue and Gray supermarket and left me in the care of a woman named--this is the South, after all--Minnie Bird. And there I learned to knit. Sometimes when I'm sitting on the floor with a duck puppet on my hand, or standing next to a light switch with the 33-pound Biscuits on my arm so that he can play another round of his favorite game of "on/off" (a physical task uncomfortably akin to the horrid flexed arm hang we endured in elementary school gym class), I think about that. Maybe a (grand)mother's act of exasperation can bring about something significant, after all. Up there, that's my Picovoli. Despite years of knitting, it is my first-ever adult-sized top, and though I'm having trouble making the joins disappear to my liking, I love it to distraction. Down here, that's the view from my chair. 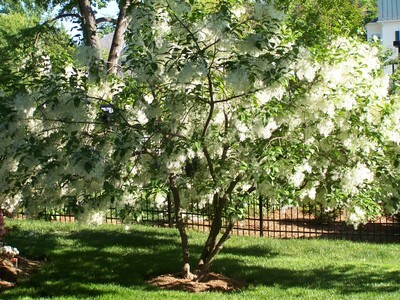 It's a fringe tree. When the wind shifts, it sends the most heavenly scent over the breeze. If I could knit with those tendrils, I would. Wouldn't you? Spring in the DC area is short-lived, but boy is it beautiful. I've added an FO's gallery and am working on a 100 Things list, which appeals to me more than the awkward "About Me" narrative. More blog-related to-do's include figuring out what to call the Man in My Life, as every time I see the abbreviation "dh" I break out in hives (bad BabyCenter momlist experience). His suggestions so far include "Dirk" and "Conan." Thanks to my friend, co-teacher, and fellow newbie blogger Beth for helping post the photos, and thanks to you for visiting. Your socks look great(so does your blog). I admit I have not even looked at my yarn since it came in the mail-verrry bad. My favorites are the Thuja socks. Man, what I wouldn't do for a pair of resplendent, warm sock. Your blog looks great! I've got a clapotis question for you, seeing that you're a clapotis expert! I'm currently making a clapotis of merino wool, but I bought some Schaeffer Marjaana to make a lighter weight one for summer. 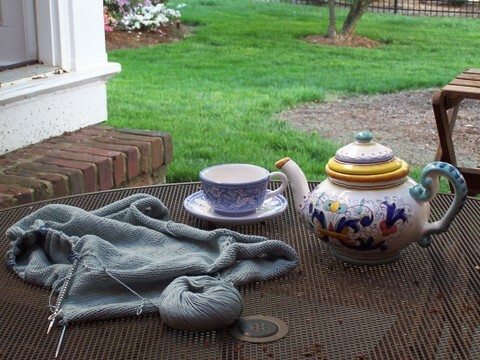 I'm wondering if you used more than one skein for yours, or if you modified the pattern (and if so how much) to get by with one skein, which is what I'm hoping to do. Thanks for any info!!! Nice blog! Welcome to the blogosphere! Oh man! When I hear Another Bites The Dust I am SO at the roller rink! Great photographs. Welcome to blogland!